Can you cross the motorway with the zimmer frame? 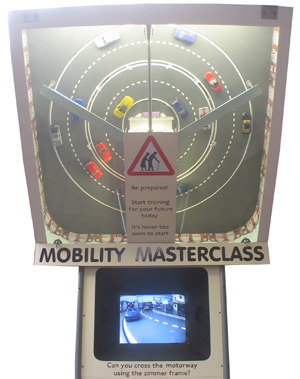 I had the idea for Mobility Masterclass over a year ago, while on a train to London. It suddenly seemed the perfect way to bring together various disjointed ideas I’d been thinking about. At the time, I was making my dog walking simulator ride (Rent-a-Dog), and was bothered that it was just too cute, sad that it wasn’t more tasteless and politically incorrect. Chris Iredale (the previous owner of Southwold pier) and I had joked about a zimmer frame ride of some sort as there are so many retired people in Southwold, but the idea had never got anywhere. 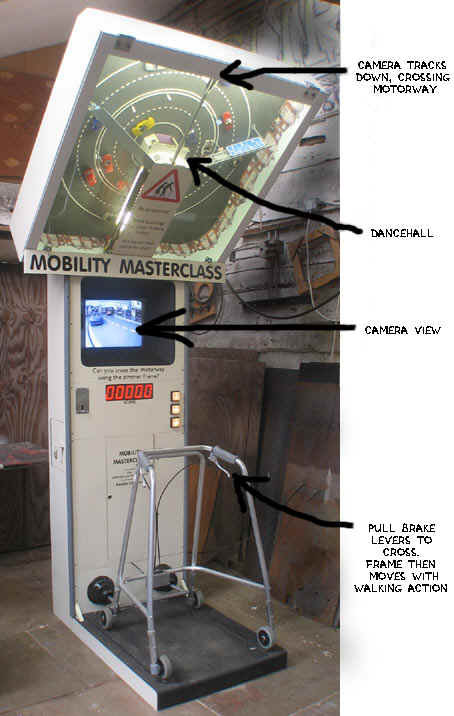 On a completely different tack, I’d been wanting to make a simulator ride with a video camera filming a real model scene. The final machine looks remarkably similar to the original drawing I did on the train. When I was younger, I never used think about being old, but I do now I’m 54. I think about aging partly one of my knees is getting arthritic and I’ve recently had to stop cycling, but mostly because my parents are getting really old. 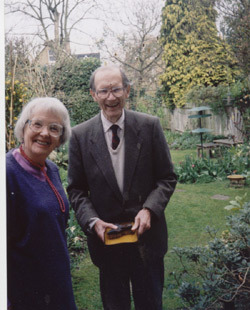 My dad is 89, very forgetful and shakey on his feet, my mum is 81, still very active but with intermittent health scares. Waiting in a queue at the bank last year two old men in front of me were discussing their health problems and one said to the other ‘getting old’s not for cissies’ – I can now see what they meant. In the midst of making Mobility Masterclass my dad went into hospital with a minor stroke and came home with a zimmer frame, which he used for a couple of months, though he’s now back to using his stick. Shortly after I’d got my zimmer frame for the ride (from an NHS recycling centre) I fell off a ladder and found myself using it in the workshop to get around. I’m delighted the way children and adults of all ages now use the Mobility Masterclass zimmer frame without any embarrassment. My ideas about using a real model came from the animation I’ve being doing recently. This involves 3D models, usually made up of digital photos. There is something fascinating about comparing a real model with its appearance on video. The model can be very rough in many respects as the video is not very high resolution, and lacks the depth clues you get from the real model as you move round it. Many imperfections in the video are not noticeable just because the animation is all so fast and busy. I thought people would enjoy this comparison, as well as just watching a finished animation. The very first simulators, made for training military pilots in the 1950s, relayed the pilot’s controls to video cameras which moved over model landscapes. Some of these models were huge, filling complete aircraft hangars. On a modest scale, I thought the camera could simply run round on a circular track. I had been thinking of a cycling game, where the faster you pedalled, the faster the camera moved, but the zimmer immediately seemed funnier. 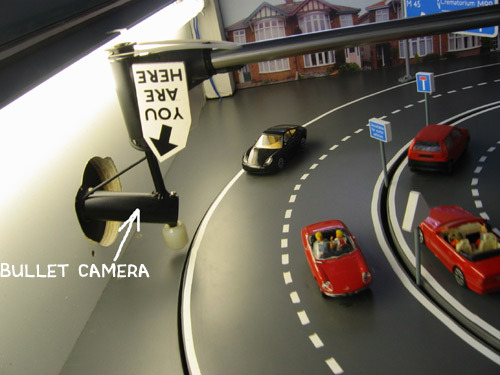 Particularly because I realised that having convinced people that they were watching a view of the model on the screen, I could then cut to pre-recorded animation whenever they hit a car, enabling the emergency services to arrive and deal with the situation. The technical challenges involved in making the machine absorbed me for about 5 months, it all took much longer to make than I’d been expecting. This was partly because trying to integrate a real model was completely new to me, but also because I wanted it to be a game of skill, so the playing the game had to fun and addictive and this required endless ‘tweaking’. I’m not sure I would have had the patience to persevere without regular visits to the arcade. Watching people pouring in money and enjoying my previous machines was very good for morale. My first experiments were with the video camera. I originally wanted to have the camera safely above the cars, (so it couldn’t get hit) with a mirror to reflect the image. Eventually I decided that to get the sensation of the cars rushing past I needed a very wide angle lens, and the camera itself needed to get very close to the cars. Abandoning my first camera, I bought a ‘bullet’ camera. When this was mounted on an angle it could just sit between lanes without being hit (though I am still a bit nervous how long it will last as the cars do ‘crash’ into it while in midst lane). The very wide angle lens showed too much space above the model but I found I could position motorway signs to mask the unwanted view. The lens still did not give a wide enough field of vision to see the traffic coming at you from both directions so I tried adding a motor to pan the camera from side to side. I was nervous about adding extra complexity but the movement looked so good I decided to keep it. Mounting the camera was equally tricky. The first attempt was so bulky it entirely obscured the view of the model. The second attempt jammed when the camera was driven into the side of a car (I’d only envisaged them hitting head on). The third attempt was OK except for the camera panning mechanism, which was too wobbly. Mark four finally seems OK. 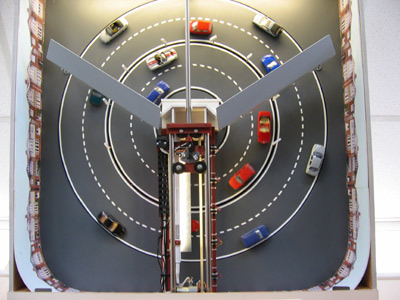 Simply making the various lanes of the road rotate was a challenge. 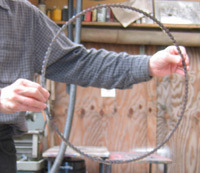 I thought I’d found a quick ingenious solution, welding the links of bicycle chain into large rigid rings to drive and support the road. It was a complete failure, jerking round and often jamming. Mark two involved thick rings of plywood, routed to form precise channels to take small ball races. The rings became absurdly heavy, so I spent ages cutting out bits I didn’t need to reduce the weight. I added the motors and it all seemed to work fine until it mounted aloft in its final position. Then the outer lanes started jamming. Graham and I spent a morning taking it down and carefully re-routing the circle, but it was no better. 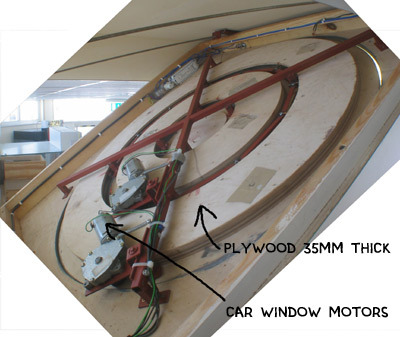 Only then did we realise that clamping the plywood to the bench had stopped it being completely flat, so the router had not been cutting a true circle. I often got so absorbed sorting out details like this that they became goals in themselves, and I often forgot about the final machine. Making the zimmer frame move was one aspect that was easier than I’d been expecting. I’d spent ages drawing different mechanisms, trying to design out any points where fingers or toes could possibly get trapped. Still a bit uncertain, I started to fabricate it. By good fortune, I’d recently bought some new polyurethane drive belt, and to my delight, I found I could accurately adjust the torque of the mechanism by adjusting the tension of the polyurethane belt. So if a toe or finger does get caught anywhere, the belt will slip and the mechanism will stop. Laid up after falling off the ladder in April was the perfect time to settle down and write the software. After a couple of weeks or so I felt it was ready to try out on a few people, but they all seemed completely confused about what was happening and what they should be doing. I realised that this is true of playing most real arcade video games for the first time – I always feel lost and score nothing. However, I wanted my game to be fun to do for the first time, so gradually the idea of some on-screen instructions took hold. These had the added advantage of building up the tension before setting off across the road, and made the whole experience a better length, as just crossing the road only takes about 30 seconds. The instructions turned into a ’Training Program’ in line with today’s obsession for qualifications and performance indicators. This new element also gave the machine its final title! At this point I got sidetracked and spent a ridiculous amount of time devising a scoring system which, now I watch people using the machine, goes largely unnoticed. Decorating the model was fun. I had the idea of the motorway looking like the A12 on the outskirts of London, though I actually used photos of houses in Southwold as they were more convenient. I found a great website with images of every single road sign, all ready to print out. I was amazed the dotted lines in the middle of the road looked so convincing. They bizarrely rotate with the traffic, but somehow manage to look perfectly normal. The ballroom was the greatest challenge (it had to be a ballroom as I wanted the zimmer to start dancing as the payoff for a successful crossing). I had a vague memory of an ornate ballroom in Blackpool and assumed there must be others, but no one seemed to know of any. 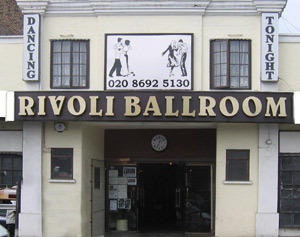 Eventually I rang a magazine called Dancing Times who rather doubtfully suggested The Rivoli Ballroom in south East London. Still not knowing what it looked like, I persuaded the reluctant manageress to let me visit and take some photos. It was fabulous and spookily, exactly what I’d had in my mind. 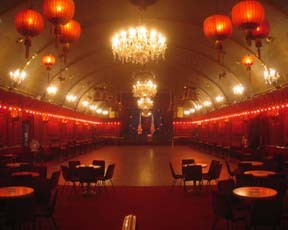 Not only were the ballroom and foyee perfect, but so was the exterior, which was almost identical to the one I’d drawn. Billy, the owner, and Charles, his barman, were great characters and I stayed chatting for hours. 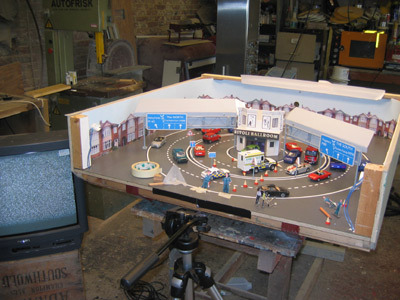 It wasn’t until the model was completely finished and everything else was working that I could detach it from the machine and put it on a table to film the animation for the crashes. 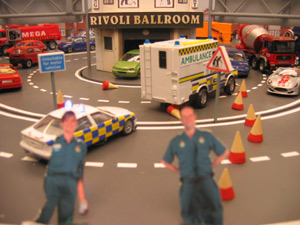 I couldn’t find any toy police cars or ambulances the right scale, so I converted some ordinary cars with bright blue LED lights on top. I was particularly pleased to find the photos of two grinning paramedics in an industrial clothing catalogue. I printed them out to the right scale and cut them out. Despite this preparation, I still hadn’t decided exactly what was going to happen in the crash scene. I’d originally though of fast cutting with lots of close-ups, but as we set up the model I changed my mind and decided to try and work with a single shot. Then Graham had the inspiration of making a tiny zimmer frame to put in the scene. Being too literally minded, I’d assumed it would seem absurd as you were still grasping the real frame. But it immediately established the accident scene, and with this final prop, the two scenes almost wrote themselves, In one, the police arrive, cone off the road, mark the position of the zimmer on the road, and then drive off. In the other an ambulance arrives with the police and the paramedics, after grinning sympathetically at you, administer oxygen. After yet more tests on people who hadn’t tried it before (I even tried to persuade the parcel delivery drivers to have a go) the final arrangement of a practice crossing and a second examination crossing fell into place. If you crash on the practice run, the police just mark the position of your zimmer and you carry on to cross the next lane. 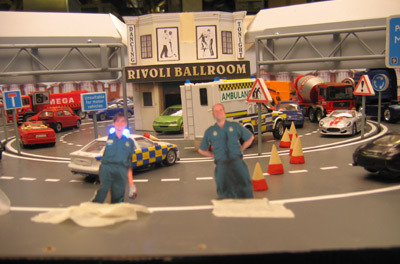 On the second examination run, a crash results in the arrival of the ambulance and the end of the game, and a successful crossing leads on to a dance in the ballroom. 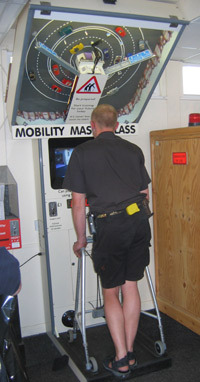 Installation on the pier was tricky because the machine was too high, so we had to raise the ceiling to accommodate it. Measuring the space it needed precisely was impossible so we made a space we thought would be large enough, but then couldn’t fit the machine in it. After attempting to modify the machine, we decided to rebuild the ceiling a second time. The next day, in trying to add some simple modifications to the software, everything all started behaving very erratically, with the camera crashing badly around the cars. It took me three days to track down the problem. People were also much more energetic in their use of the zimmer than I’d been expecting, so it needed urgent modification. Fortunately the simple addition of two bungee straps tieing it to the base work amazingly well. The video needed speeding up a bit, as people’s attention started to wander at times, and there are still technical details that I’m not quite sure about, but as I write, I think its finally nearly there. I'm delighted how nervous people are about crossing each lane - it really does make you feel vulnerable. When I was testing the software, I had to try crashing on every lane, but I found it quite hard - Its just so instinctive to avoid crashing.